"The Forbidden Sounds of Don Tiki"
The sounds of the tropical jungles are alive and well through the musical magic of Don Tiki. (And, to clarify things, Don Tiki is a group rather than a single person. Just think back to the classic rock band Jethro Tull.) On The Forbidden Sounds of Don Tiki, the band takes their musical cues from such exotica notables as Les Baxter, Arthur Lyman, and the legendary Martin Denny. In fact, it's not surprising to see Denny step out of retirement for a bit to help Don Tiki on a few tracks. It's a wonderful symbolic passing of the tiki torch from one generation of music makers to another. Exotica, by and large, is not an easy style to pull off. You have to have the right combination of musical chops and pop culture playfulness. Too many bird calls and oriental chimes and you sound ridiculous. Too few, and you'll have the exotica purest lamenting for the glory days of Quiet Village and Voice of the Xtabay. For the most part, this album is comprised of original compositions with a few choice torch songs thrown in (like the playful "An Occasional Man" and the sultry "Close Your Eyes.") With an album like this, it's not hard to say that Don Tiki can hold their own against some the great album in the tropical musical catalog. 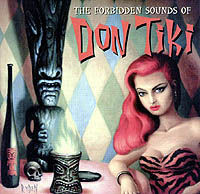 To explore more of the forbidden world of Don Tiki, check out their website, www.dontiki.com!